Browse our directory of professional members to find BC health care providers who are involved in the diagnosis, treatment and management of vestibular disorders. DISCLAIMER: BC Balance and Dizziness does not endorse any medical practitioner, clinic or service mentioned on our website. Please do your own due diligence when selecting a medical professional or service. Filters: Select a profession and/or a location from the dropdown lists. Reset Filters: Select "Choose a Location" and/or "Choose a Profession" from the lists. Search by Name: Type a name into the "Search by Name" box below and hit "Enter" on your keyboard. Reset Search by Name: Click the "X" on the right hand side of the Search by Name box below. Note: The "X" will show up once you have entered your first search term. Marj’s interest in whiplash and concussion motivated her to learn more about vestibular physiotherapy. Prior to 2016, she participated in three vestibular rehabilitation courses. She greatly improved her knowledge, skills and confidence in helping people with vestibular disorders optimize their recovery by taking a six-day course in 2016; as a result, Marj holds a certificate in vestibular rehabilitation from Emory University. Since obtaining her physiotherapy degree at the University of Alberta in 2004, Catherine has worked in private practice and work conditioning programs in Calgary and Kamloops. In 2012 she completed an intensive one-week Vestibular Rehabilitation Competency course in Atlanta, Georgia, gaining specialized rehabilitation skills appropriate for all patients with vertigo, dizziness and imbalance problems. Catherine added to these skills by completing further advanced training for vestibular rehabilitation at a one-week course in Durham, North Carolina. Kelsey Cook is a registered physiotherapist and holds a certificate in vestibular rehabilitation from Emory University.She enjoys working with people with dizziness and balance issues. Additionally, she has taken courses on post-concussion syndrome including learning about how contributions from the neck and vision an cause dizziness. She has a passion for working in vestibular rehabilitation because improving vestibular issues can really impact how someone can function day to day. Jamie’s special clinic interest is in providing optimal rehabilitation outcomes for patients who have injuries to their vestibular systems and/or concussions. He instructs courses for rehabilitation professionals on interdisciplinary concussion management and vestibular rehabilitation. He strives to stay up-to-date on the evidence to support his practice, achieving the best outcomes possible. Roly completed a course in vestibular rehabilitation at Emory University (2016) and is interested in complex cases of pain, dizziness and concussion. He is also a clinical associate professor at UBC. Abeed graduated from both SFU and UBC in 2004 with a Bachelor of Kinesiology and a Bachelor of Occupational Therapy degree respectively. Since graduation, His passion Since graduation, Abeed has honed his skills in the assessment and treatment of patients with dizziness and balance disorders, concussions and other forms of traumatic brain injuries. His passion for treating patients with dizziness, vertigo and balance disorders motivated him to seek further education in vestibular rehabilitation. To this effort, Abeed achieved his Competency Certification (Advanced) in Vestibular Rehabilitation from Emory University School of Medicine in Atlanta, GA (2007) and Duke University School of Medicine in Durham, NC (2009). Dr. Sandy Johal is a board certified developmental optometrist. Her primary care practice has a special emphasis on pediatric, binocular and developmental optometry. Dr. Johal graduated on the Dean’s List from UBC in cell biology and genetics. She went on to pursue a Doctor of Optometry from Pacific University College of Optometry. Dr. Johal is a Fellow of the American Academy of Optometry and College of Optometrists in Vision Development (FCOVD). Sarah obtained her physiotherapy training at Auckland University of Technology in 2004. She has developed particular expertise in conditions of the head, neck and face, including balance disorders. In 2010 Sarah became a Certified Cervical and Temporomandibular Therapist via the Physiotherapist Board of Craniofacial and Cervical Therapeutics (US). She noticed that many jaw and neck patients suffered from dizziness, and thus completed Advanced Vestibular Therapy training in 2014. In 2016 Sarah completed training for the treatment of Facial Palsy/Bell’s Palsy and in 2017 she completed training in Post-concussion Rehabilitation. Maisy has worked in private clinics treating orthopaedics injuries as well as work and motor vehicle-related injuries. In the past few years, she has taken a keen interest in vestibular dysfunctions in the adult and geriatric populations. Maisy holds a certificate in vestibular rehabilitation from Emory University and has completed post-graduate training in concussion management and medical acupuncture. Pauline has been a registered physiotherapist since 1993 and has extensive experience working with individuals with neurological and vestibular conditions. She is the owner of Neuromotion Physiotherapy. She has recently completed Dynavision training as well as coursework in concussion rehabilitation and exertion training after concussion. 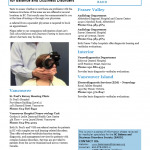 Pauline holds a certificate in vestibular rehabilitation from Emory University.